Million-dollar question: Who will be Congress' CM candidate in MP? Battle for the Hindi Heartland: Whose year will 2019 eventually be? 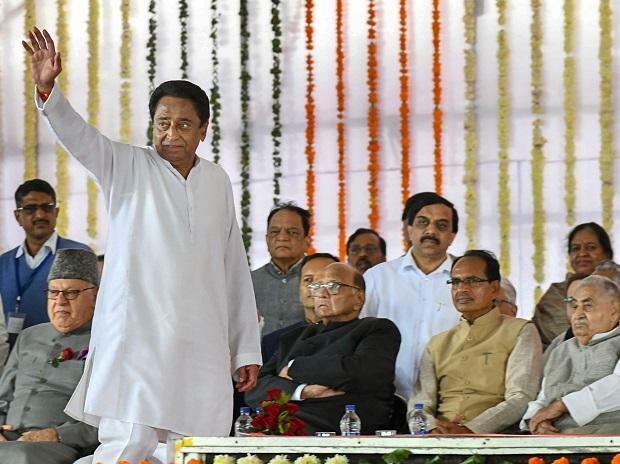 Madhya Pradesh Chief Minister Kamal Nath will expand his cabinet later this week. While a formal announcement on the expansion or the possible date is awaited, Nath’s meeting with his party’s central leadership in Delhi on Sunday fuelled speculation that it would happen before January 20. Other senior party leaders from the state were also present at the meeting where they gave their suggestions on the prospective candidates to be inducted into the CM’s team. According to sources, MLAs of the Samajwadi Party (SP), Bahujan Samaj Party (BSP) and one independent MLA may get cabinet berths. Nath formed his cabinet on December 25, inducting 28 ministers, all from the Congress. Given that the Congress was able to form the government in the state with support from the SP and the BSP, it is likely their demands will be met. After its hugely successful booth-level strategy failed to leave the usual impact on the Madhya Pradesh Assembly polls late last year, the Bharatiya Janata Party (BJP) is working harder to fire up the rank and file. Its cadre in the state is now working on a three-month programme calendar prepared by the party’s central leadership to woo back voters before the general elections. The party has appointed new panna pramukhs (page in charge) at the booth level after dropping many of the incumbents. The new panna pramukhs have each been handed a page from the electoral roll with mobile numbers and addresses of at least 15 families. It is the duty of the person in charge to contact these families from time to time, listen to their problems and then solve them, and, if possible, lead the members of these families to the polling booth during this year's election. A day after meeting Bahujan Samaj Party (BSP) supremo Mayawati, Rashtriya Janata Dal leader Tejashwi Yadav met Samajwadi Party (SP) chief Akhilesh Yadav on Monday. Tejashwi used the opportunity to target the Central Bureau of Investigation and the Enforcement Directorate, saying the central agencies had become "alliance partners" of the Bharatiya Janata Party (BJP). He said that while the BJP had about 118 seats in Uttar Pradesh, Bihar and Jharkhand together, after the newly formed SP-BSP alliance in UP and the Mahagathbandhan in Bihar, the party would “go down to less than 100 seats in the three states”.